How do I set up email in Drake Tax? Drake Email - Error Sending "Under The Current Settings"
You can send email to Drake from return data entry without setting up an email account. To email other recipients from Drake Tax, you must set up a third-party email account. Note: The 1040.com email account formerly supplied with the software are no longer available. It is MAPI-compliant (Messaging Application Program Interface). 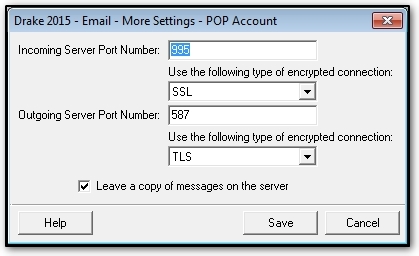 It is set as the default Windows email program, described below. Drake Software View mode - see "Using Email in Drake View or Print Mode" in Related Links below. Drake Documents - in either the Working or Archive Cabinet, select Setup > Options from the menu. On the Drake Documents - Options dialog box, select I use an email program on my computer and click Save to save the change. Drake Scheduler - select Setup on the Scheduler toolbar. On the Email tab of the Drake Scheduler - Setup dialog box, select I use an email program on my computer and click Save to save the change. Designating your email program as the Windows default email program. Windows 7. Go to Start > Default Programs > Set your default programs (or Control Panel Home (for Windows 7 set to View By: Category) > Programs > Default Programs > Set your default programs). Select your email program from the list and click Set this program as default. See this Microsoft articles for details: Change which programs Windows uses by default. Windows 10. Go to Start> Settings>Apps> Default Apps> Email. Click on your current default email program and select the email you wish to make the default app. You can set up third-party email accounts for three kinds of users - ADMIN, office and preparer. An ADMIN account - Log in as ADMIN. On the Home window, go to Help > Email > Setup > Accounts. Click Add Account, select the account type, click OK and complete setup on the Add Account dialog box. Click Test Settings to make sure the setup works. Click Save to save the setup. An Office account - Log in as ADMIN. On the Home window, go to Help > Email > Setup > ADMIN Options. Click Setup Office Email Account. Select the account type, click OK and complete setup on the Office Account dialog box. Click Test Settings to make sure the setup works. Click Save to save the setup. When you complete office account setup, turn the account on by selecting Use Office Email Account (Help > Email > Setup > Accounts). A Preparer account - Direct the preparer to log in and complete these steps. On the Home window, go to Help > Email > Setup > Accounts. On the Account Settings dialog box, click Add Account, select the account type, click OK and complete setup on the Add Account dialog box. Click Test Settings to make sure the setup works. Click Save to save the setup. 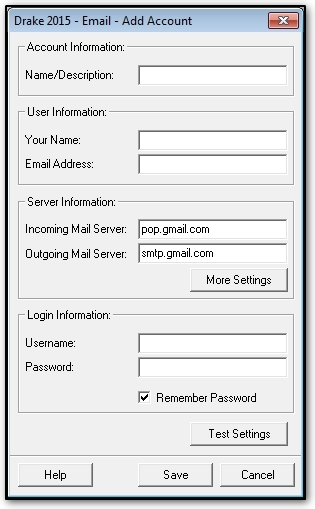 See "The Add Account Dialog Box" later for more information about email account setup. A third-party email account set up in Drake17 can be selected for use in the Drake Document Manager Working or Archive Cabinet. You control who uses an Office email account or a Preparer email account. Log in as ADMIN and go to Help > Email > Setup > ADMIN Options. The three option boxes are general settings that apply to all preparers. No option selected - preparers can set up and use only their own individual email accounts. Allow Each Preparer to Use the “Office” Email Account - If office email is set up, preparers can use the office account and also can set up and use individual email accounts. Force Each Preparer to Use the “Office” Email Account - If office email is set up, preparers can use the office account but cannot set up individual email accounts. 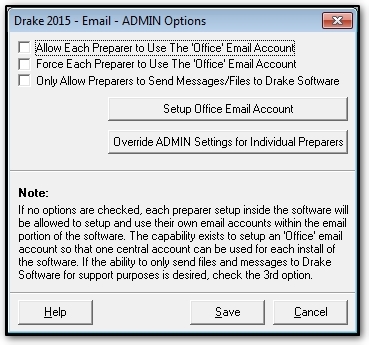 Only Allow Preparers to Send Messages/Files to Drake Software - Preparers cannot set up individual email accounts and cannot use the office account (if one is set up), but they can send emails and attached client files to Drake Support from within a return. To override the general settings for one or more individual preparers, click Override ADMIN Settings for Individual Preparers. After you select an account type (an email provider) and click OK on the Account Type dialog box, the Add Account dialog box opens for preparer or ADMIN email, or the Office Account dialog box opens for office email. They are the same except for the dialog box name. The Add Account dialogue box is shown below. Complete all fields. The Incoming Mail Server and Outgoing Mail Server fields may already be completed, based on the email provider you selected. Name/Description - Enter a familiar name for the account, one that you will recognize. Email Address - Enter the email address for the account you use (for example, MaxsTaxes@EmailProvider.com). Incoming Mail Server - available from your email provider. Outgoing Mail Server - available from your email provider. Username - the username you use to log in to your email account. Password - the password you use to log in to your email account. Note Drake cannot retrieve or reset this password. You must contact your email provider. Test Settings - after completing all the fields on the dialog box, click Test Settings. 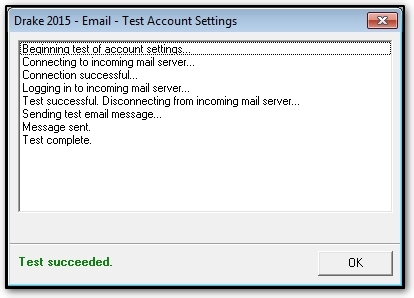 If the Test Account Settings popup indicates Test succeeded, click OK and click Save to save the settings. This completes account setup. 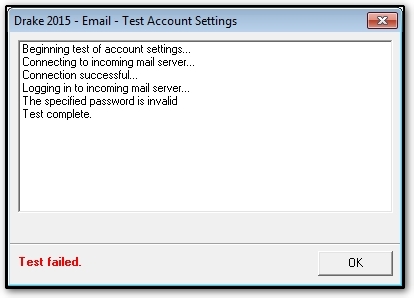 If the Test Account Settings popup indicates Test failed, click OK and proceed. For a failed test, confirm that the information entered is correct. Make any corrections needed and test again. Note: If you confirm that all settings are correct, but continue to get Test Failed, contact Drake Support at 828-524-8020 for additional troubleshooting steps. If the information is correct, click More Settings to open a dialog box. Confirm that the More Settings information in each field is correct. You may have to contact your email supplier. Make any needed corrections, click Save to return to the previous screen and test the account again. When the test succeeds, click Save to save the account. Drake recommends that you not save the settings for an email account unless it passes testing. Saving a non-functioning account can interfere with emailing a client file to Drake from a return. Note: If you want to delete an email account from the program, you must first delete all emails that you have downloaded to the software. Under more settings, if you unchecked the box "leave a copy of messages on the server", you will be deleting the only copy of the email. If you left the box checked when setting up the email, verify the emails are on your web server prior to deleting the emails. When you set up your Drake email account (Help > E-Mail > Setup > Accounts > Add Account), you have a large list of popular email suppliers to choose from. Your selection automatically completes the incoming and outgoing mail server information in the email setup window, and you can still set up server information manually if you prefer. In the Drake Documents, go to Setup > Options and mark Use my Drake email account. In the Scheduler, go to Setup and select the Email tab. Mark Use my Drake email account. In Drake Documents and the Scheduler, you still have the option to use a MAPI-compliant email program installed on your computer (such as Outlook). Under the current settings/configuration, the software only supports sending messages to Drake Software. When an email account is set up, messages can be sent to others. Drake Software requires a third party email account from an online provider to send email to any address other than DrakeSoftware.com. or email from outside Drake Software. Article has been viewed 27K times.